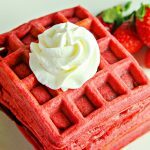 Make a special breakfast with this homemade Red Velvet Waffle recipe! Perfect for Valentine’s Day, Christmas Day, or for anyone who loves Red Velvet Cake. Grease waffle iron and begin preheating according to manufacturer instructions. In a large mixing bowl, whisk together the flour, sugar, cocoa powder, baking powder, and salt. Set aside. In a separate bowl, beat together the eggs, buttermilk, butter, vanilla, and vinegar with a whisk until thoroughly combined. Add red food coloring until it is slightly darker than the shade you want since it will lighten a little while it cooks. Add the wet mixture to the dry mixture and fold to combine thoroughly. Cook waffles according to your waffle iron instructions and size. In most cases, they should be done when they stop steaming. Serve with whipped cream or a cream cheese frosting.